Natcon - The New Zealand National Wargaming tournament happened in Christchurch over the long Easter weekend last week, and I entered the ADLG tournament. 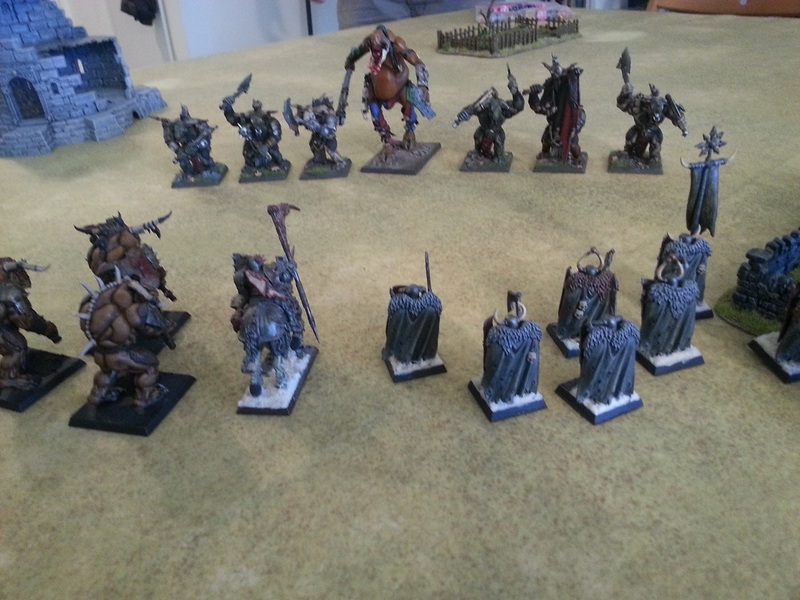 The format was 9 games over 3 days, with 200 point armies and 2 hour rounds. 14 people entered the competition, in addition to some others playing casual games because they couldn't attend the full 3 days. DBA and big battle DBA was also being played. I took my Indians again. 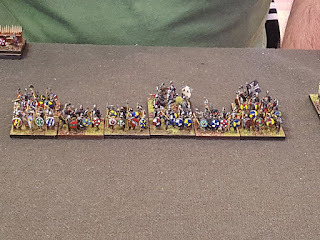 Having learned from my first ADLG tournament earlier in the year, I added more light infantry to defend my elephants, and more swordsmen to replace some of my bow. Most of the swordsmen were also impetuous which was a type I hadn't used before, meaning it would be hard to stop them charging once they got close to the enemy. But I wanted them charging so that didn't bother me! My army setup was essentially a long line of medium swordsmen alternating with elephants. 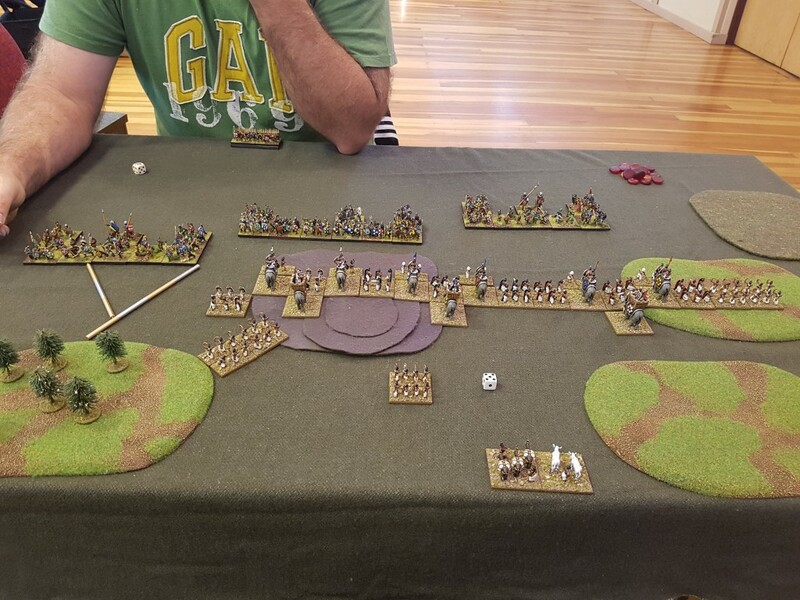 Light infantry guarded each elephant, and some bowmen of mediocre quality guarded the flanks. 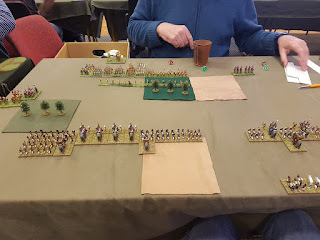 The army hits like an out of control train in the first round of combat, but can't survive a battle of attrition, and it manoeuvres like a brick! The idea was to smash as much of it as I could into suitably vulnerable sections of the enemy line (i.e. all of it!) 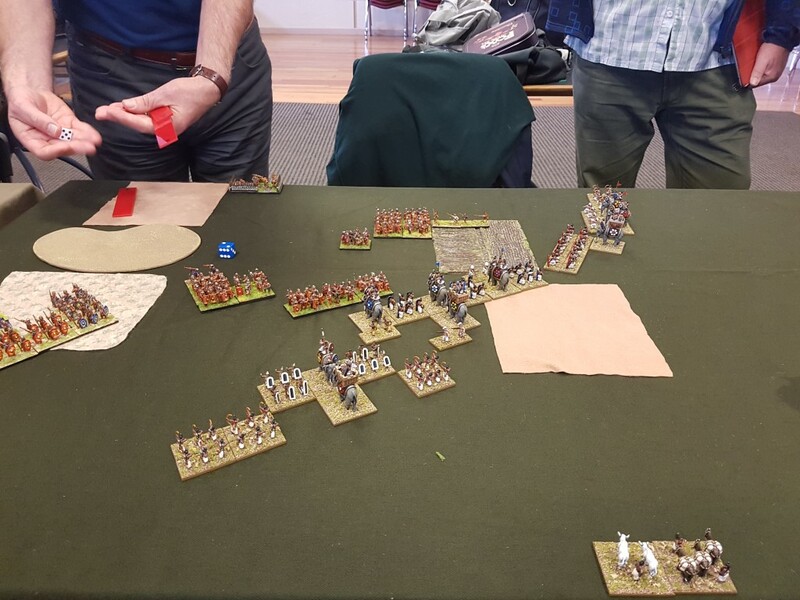 and hope they suffered enough casualties before my flanks collapsed or attrition told on my own troops. Here's a (very) brief account of the games! 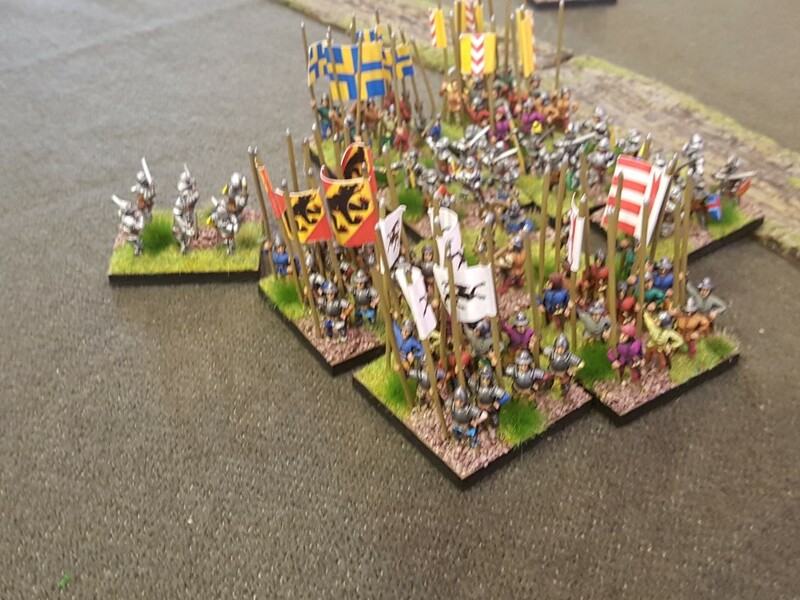 A line of solid spearmen presented a formidable opponent here. However, the Carthaginians were light on skirmishers, so my own were able to inflict a few helpful casualties before our lines met, and on my right the Carthaginians attacked in too piecemeal a fashion, with their own impetuous Gauls insisting on attacking at an inopportune time and opening them up to counterattack. 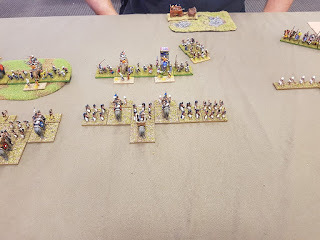 The middle of the line was a hard fight, but the rest of the Carthaginian army collapsed quickly as I exploited the holes opening on the right where the Gauls had vanished under elephants. Win to me, and I lost about 9/25 elements. Forgot to take a photo of this one. 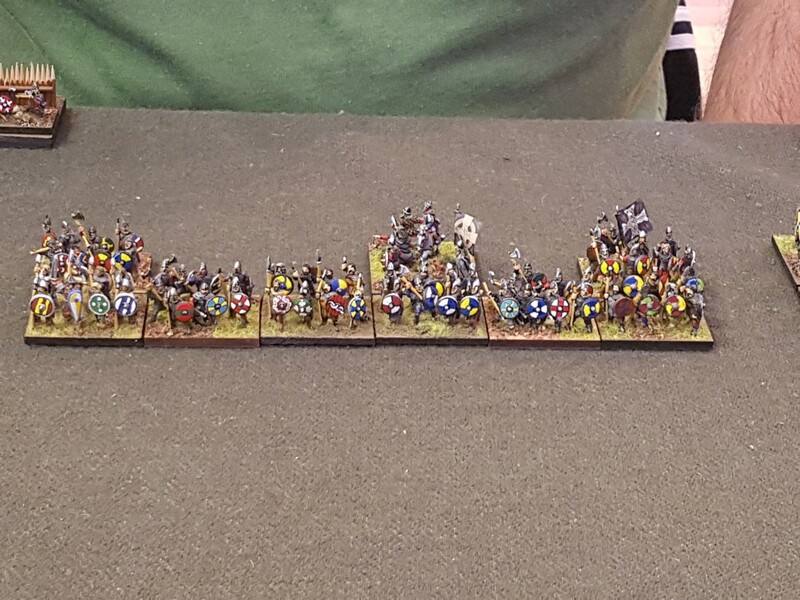 A small elite army of Byzantines with a cavalry command, and two mixed spear and bow formations. 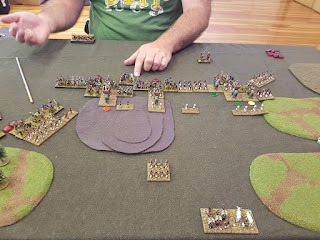 Shooting from the Byzantines as I advanced led to some anxious moments as my disordered swordsmen and elephants charged, but the impact of elephants and swords in greater numbers gave the game to me. If I recall correctly I lost 15/25 elements. 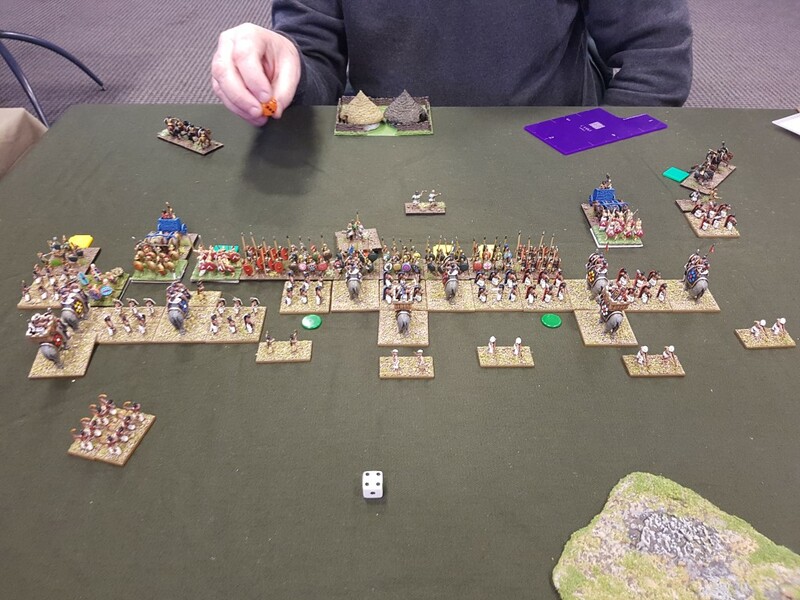 The Romans tried a refused left flank, and advanced strongly with their medium infantry on my left. I rushed to overwhelm the refused Roman wing. As both our right wings swept onwards to victory it ended up being very close. My mediocre bowmen got lucky and looted the Roman fortified baggage (needing to roll a 5-6 on a D6 to do so), just before the Romans destroyed my own baggage. Win to me and I lost 24/25 elements! The Irish! Lots of lightly armed javelinmen on the flanks, and the fearsome double handed weapon wielding Galloglaich elites in the centre. I'm relying on overwhelming the right and refusing my left, and the Irish have a similar plan. 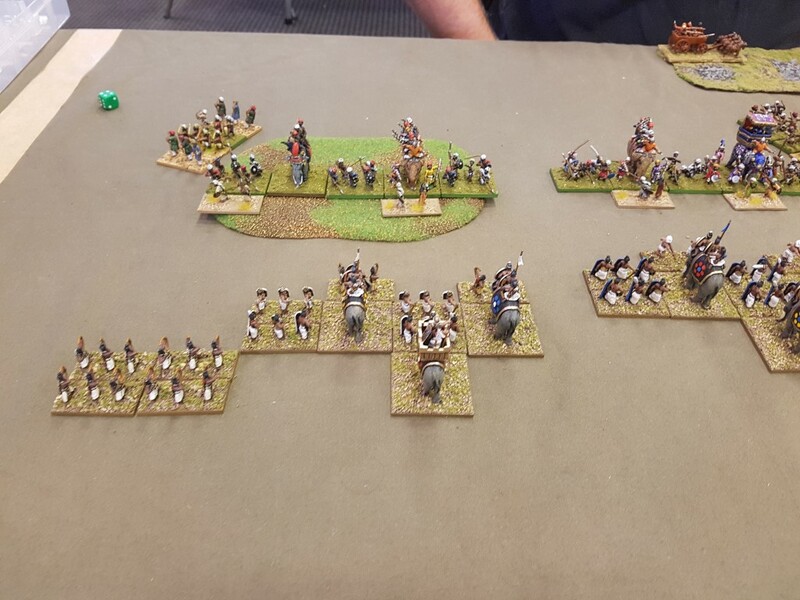 The Galloglaich hold my initial charge and then cuts my line to pieces without loss, while my right has some success it is too little. I lose and inflict about 12/24 casualties. Another game I forgot photos for. 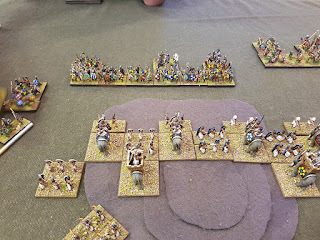 The Assyrians dismounted from their chariots, but being a heavily cavalry force otherwise it was always going to be a difficult game for them against all the elephants. They did well to gain some success with their infantry, but eventually casualties against their mounted arm told against them. I won and lost about 14/25 elements I think. Other Indians! 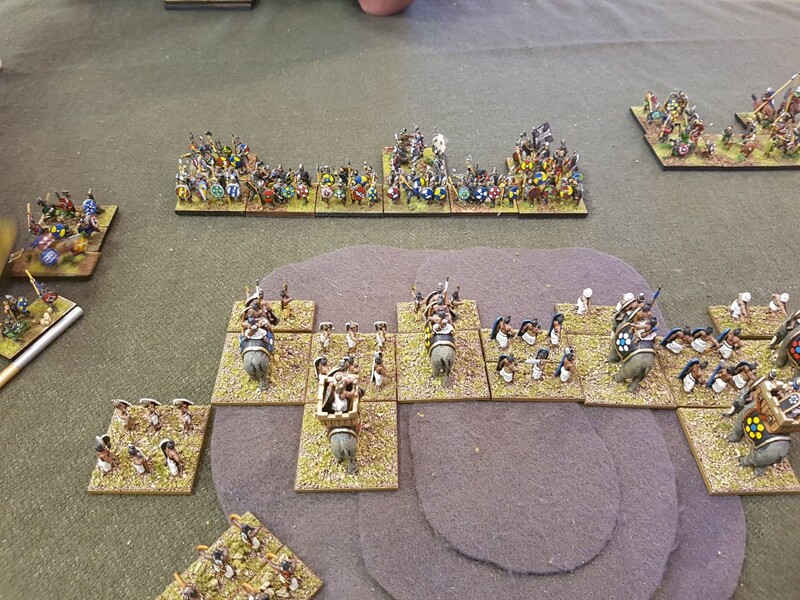 Elite elephants to my ordinary ones, and Rajput cavalry opposing my right wing. 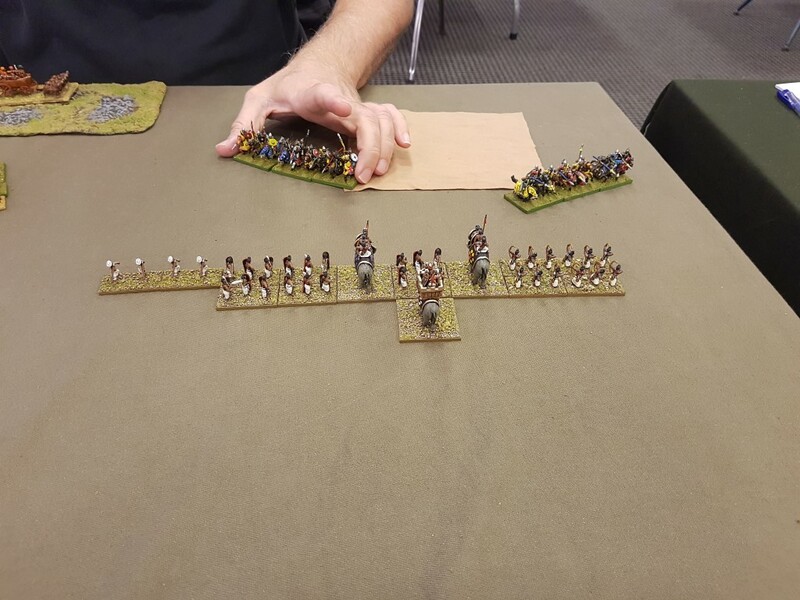 Right, with the Rajput cavalry splitting their line to avoid the elephants as best they can. 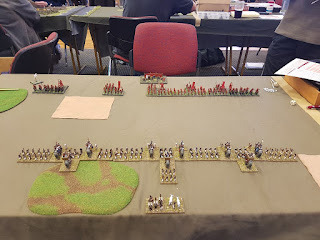 The elite elephants beat up my ordinary ones, and the Rajputs splitting their formation lets them inflict significant damage on my infantry before the elephants can chase them away. I lose the war of attrition, and inflict about 14/23 casualties I think. Overconfidence from expecting to just roll over the Rajputs got the better of me here. 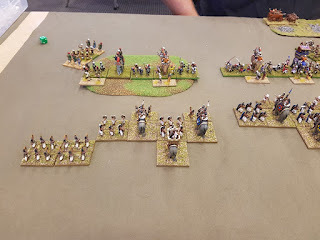 An interesting game with the battle occurring in a confined space on the left flank. My right wing swings forward, and I struggle through a plantation (including with an elephant which was stupid of me). 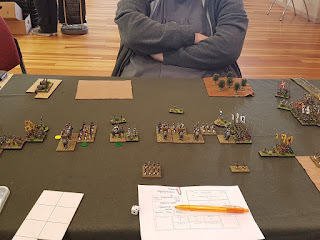 Our light troops fight it out and I manage to drive his back. 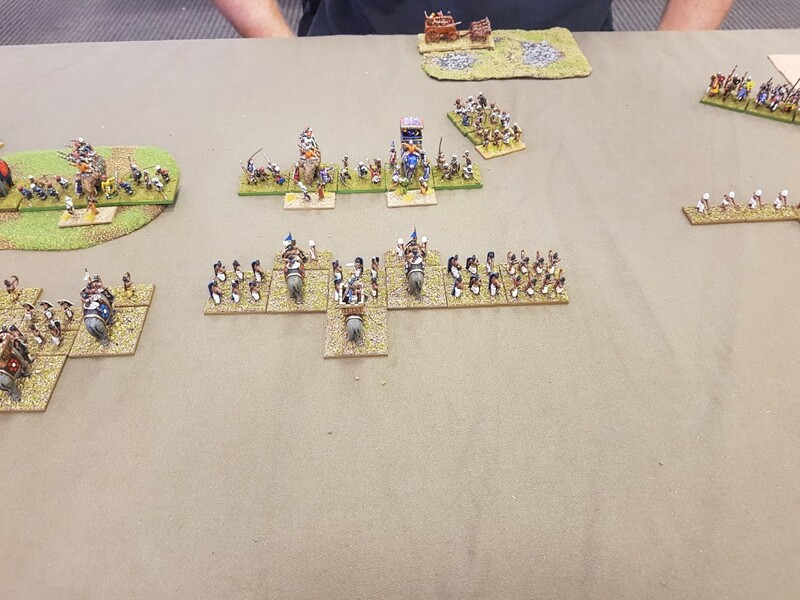 My Swordsmen break some Pike and Thracians, and are then ridden down by Lancers in turn. My bow keep his mounted at bay and shoot down some optimistic camels. I win eventually, having lost about 20/25 elements. Our two lines smashed into each other without too much manoeuvering beforehand. 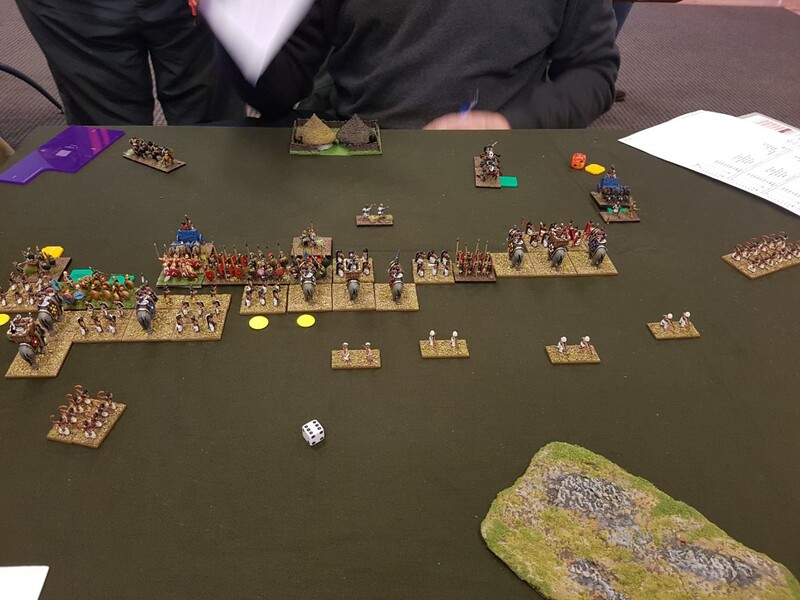 The Samurai volleys of bow fire inflicted significant disruption though and I just managed to squeeze out the victory due to some luck. Very close I lost 24/25 elements yet again! 6 wins, 1 mutual destruction, 2 losses. A result which secured me third place. A fun tournament, thanks to Andre for umpiring, and my opponents. I was finished by about 2:30pm each day so very easy on fatigue levels despite being a 3 day competition. The possibility of extending the rounds to 2.5 hours was discussed which might give horse archer and manoeuvre type armies a bit more time to do their thing perhaps. Rules were reported on positively by everyone I spoke to, suitable for competition with fast exciting play and a very wide range of armies having a chance. 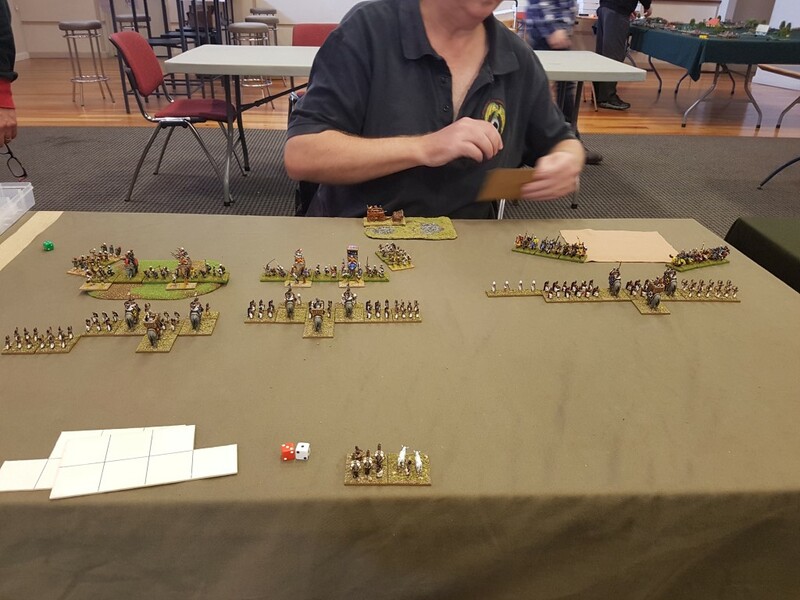 Another comment an Australian made was we need to work on getting some better terrain for our Ancients and I agree. As he said it's not of a great standard when you compare it to the Flames of War tables for instance. Local Clinton can hopefully help us out with that problem shortly!